Hanoi (VNA) – Vietnam is one of the most efficient power markets in Southeast Asia, and has achieved nearly 99 percent electrification with relatively low cost in comparison to neighbouring country, according to the Ministry of Industry and Trade (MoIT). 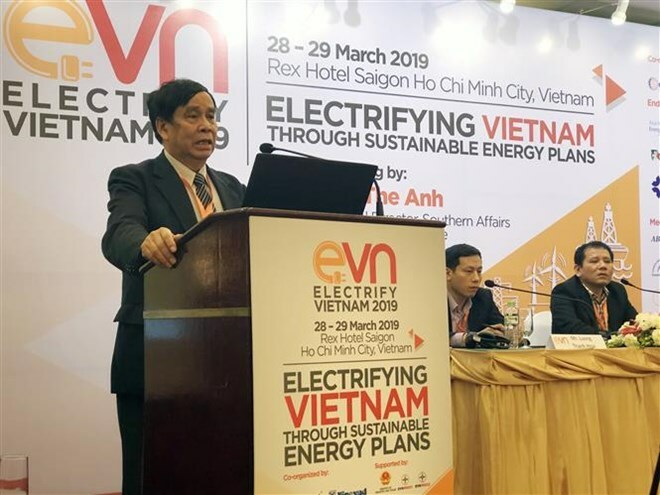 The ministry shared the information at the Electrify Vietnam 2019 Conference held in Ho Chi Minh City on March 28. According to Phan The Anh, deputy director of the MoIT’s Agency for Southern Affairs, power demand is forecasted to growth by more than 10 percent each year from now to the end of 2020 and by 8 percent annually during 2021-2030. Therefore, to satisfy the increasing demand, Vietnam will need 60,000 MW of electricity by 2020, 96,500 MW by 2025 and 129,500 MW by 2030. The country has diverse energy sources, ranging from coal, oil, natural gas, hydropower, and renewable energy. At present, hydropower and coal-fired power lead amongst the power generation sources, and will continue to be the main short-term power sources for the country. In the context of rising power demand, the Vietnamese Government has revised its power development plan in the direction of raising the power output from renewable sources. The Government also affirmed the importance of the stable and sustainable development of power sources in socio-economic development. Nguyen Van Vy, Vice Chairman of the Vietnam Energy Association (VEA), said many foreign organisations are supporting Vietnam in assessing energy source development potential. Many investors have also expressed interest in the energy market in Vietnam, considering preferential treatment for investment in solar and wind power.